What is it about sunsets that make us stop what we are doing and absorb their beauty. or from my backyard, I can't help but be in awe. we march to the beach for sunset. Each evening we are treated with a different scene. As the day begins to fold up, one by one they depart. Until the very last one performs his curtain call. It would be embarrassing to tell you how many sunset pictures I have. I'm a crazy snapping fool at sunset. It is February! Woot woot! with days that will grow longer! This business of the sun setting around Philly at 5:15 is for the birds! Anna Maria sunsets were a whole hour later. These are absolutely breathtaking sunsets, Reena!! I do so understand -- I have an obsession with skies and sunsets and have hundreds of captures to prove it! 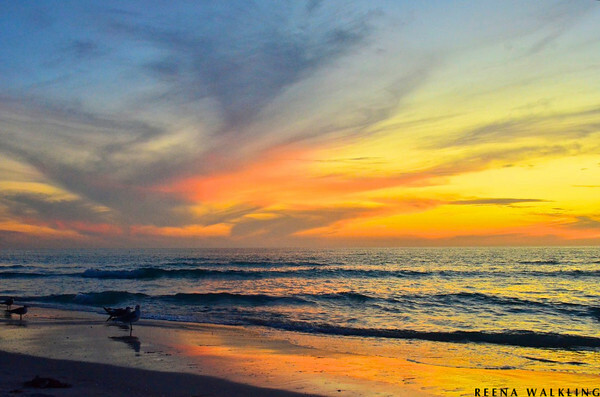 Fortunately, here in Seattle we do have lots of awesome skies -- as you obviously do in Anna Maria! Thanks for sharing the beauty! Have a great week! Lovely, lovely sunset!!! Enjoy it and drink a toast to those of us who don't see them regularly, okay? Oh, again, I'm so envious! However, I was just commenting to my husband how nice it was that it's no longer dark at 4 p.m.! Your sunsets are gorgeous! They always look like a warm blanket coming to tuck you in for the evening. Your pelicans are so cute below! Great photos! thanks for sharing your scenes with us tonight! It certainly doesn't get better than this Reena .... Watching a beautiful sunset over the sea with glass of good wine in hand ... Absolutely magical. I can't resist watching the sun rise or set. these are beautiful. I like the last one best. 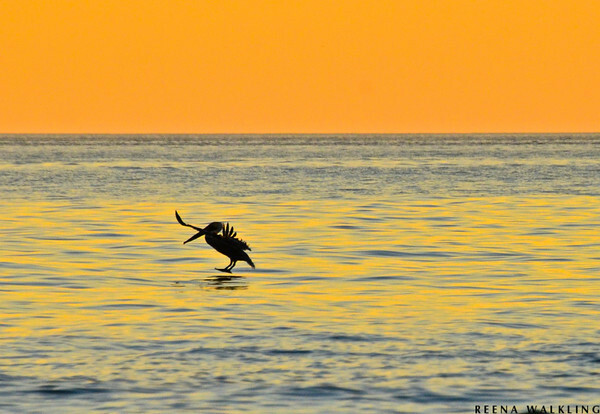 I just love the Pelicans, great capture. Absolutely beautiful sunsets, the ones with the birds flying across are magic. Beautiful pictures. So just how many sunset pictures do you have? Come on, embarrass yourself. I am always snapping photos of sunsets; but I have never got one that matched what I was seeing with my own eyes. Your photos do sunsets more justice than mine, though! Wonderful sunsets, especially the third one -- I love those colors. 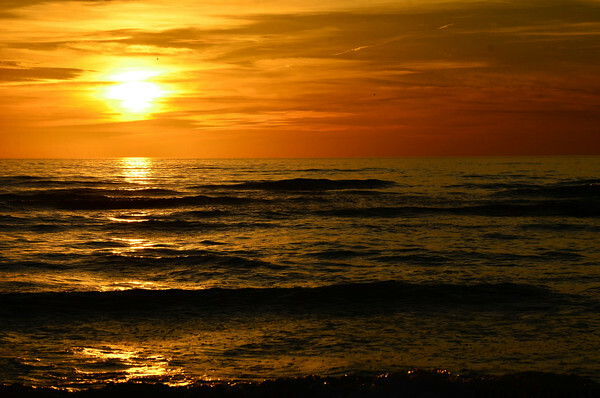 There is no place like the beach at sunset....sip your wine and think of us. I'm glad to see that your just as snap happy with sunsets as I am. I feel the same way about sunsets, I can't seem to get over how amazing they can be. What's great about them is that there are never two that are the same! I love sunsets, and you got some beautiful ones. Sunrises aren't so bad either. I just never want to get up early enough to look at the sunrise. Not only are they different from day to day, but the one you're watching changes every few seconds. I think I prefer sunrises because there are fewer people around. 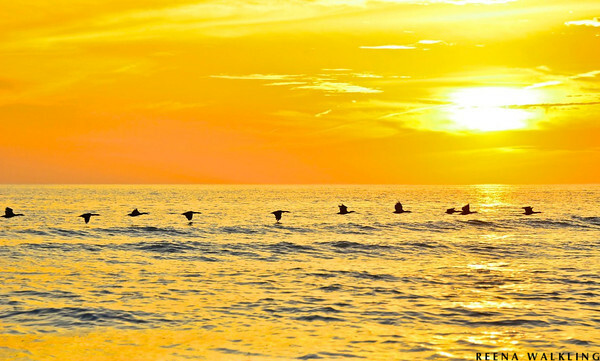 Such gorgeous sunsents, I love how they are all different. I especially love that first one. Absolutely breathtaking!! The color..the light..the warmth. WOW! Oh my goodness...these are all amazing. Esp love the last photo! I can totally understand why you snap away during sunsets because each passing second offers its own magic moment. It's amazing how quickly the scene changes. I love the one with the line of skimming pelicans just above the water, they so fascinate me. These are just amazing. Here in the UK you rarely get a good sunset! I too am a sunset fool .. I've got a bazillion shots of the sunset over Chesapeake Bay as shot from Bud's Beach on Gwyn's Island .. come along this summer to BlogFest and take some there! You're right. It doesn't get any better than this. Gorgeous. Thanks so much for sharing. Love that final pelican! Wow wow wow! I can never get enough of the sunset! That last shot should be framed - it really is totally stunning. Just gorgeous, what a beautiful place! In my humble opinion, there can never be too many sunrise and sunset pictures. Yours are stunning. I've heard sunsets on Key West are like no others!! The internet in my area of the city was down this morning. I'm playing catch up. These are just beautiful. I rarely see a sunset as I am surrounded by woods. Beautiful photos, I like a sunset too. I love a good sunset picture and these are some of the best. Beautiful pictures. aw, reena, thanks so much for brightening my day! Beautiful job Reena! I especially like that third one... enjoy we're not getting any spectacular sunsets here. I don't think you can have enough of these gorgeous sunset shots! 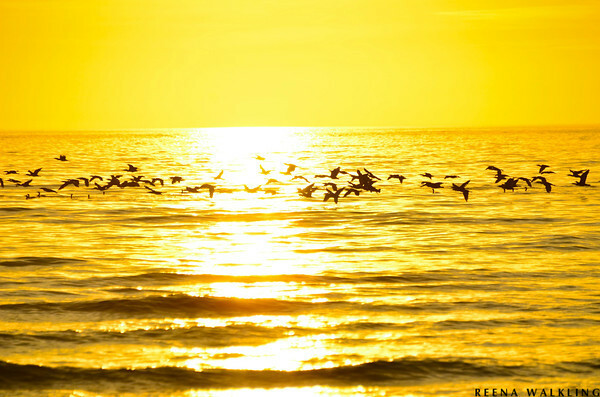 birds and breathtaking sunsets on the beach ... ahhh... what a blissful combination! Oh my ..... these are Breathtaking!! I LOVE sunsets and sunrises!! And of course the birds are an added bonus!! 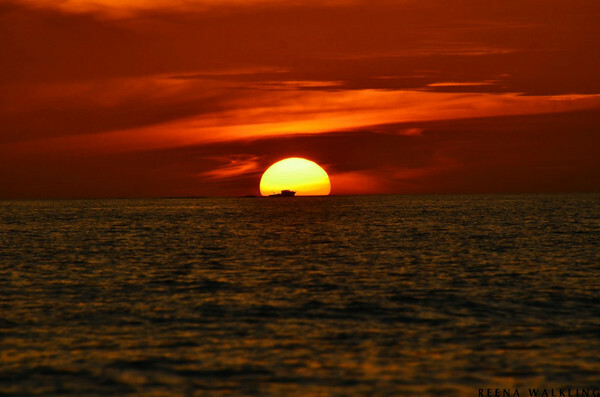 I also love sunsets and think that a perfect sunset needs the water (the sea or a lake or a lagoon). Reena, all of these are just gorgeous, but the first one here is beyond that! What a superb image, and how fortunate you were to be able to capture it. Oh how I love sunsets. And these are gorgeous. I just love that last shot..
Maybe that's why we like them- they make a place we may see every day look different every time. And in Maine, they're an hour shorter. I know what you mean about the sunsets. I think many of us feel that way. Liquid gold here. And we have only 29 days. And you have only 29 sunsets. I just know that impulse to start madly clicking when the sun goes down. Lovely warm shots! Wow - that is a really great set of images. Glass of wine, chair, beach, birds - not a bad combination all in all! amazing! words are too less to describe the wonderful feeling I get when looking at these photos! There are so many momemnts that are free and wonderful and beauty that makes one breathless. These photos offer all those moments. 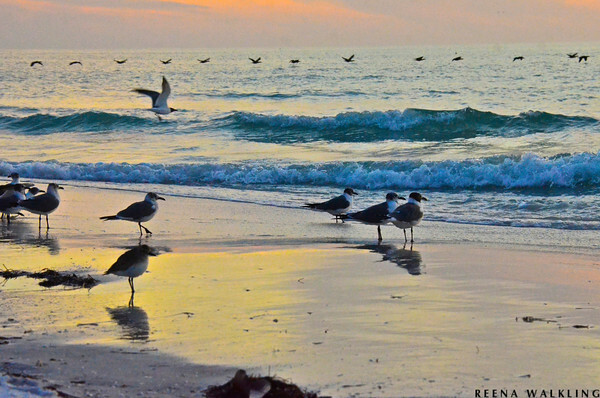 Gorgeous photos, Reena! We always try and make a habit of going to the beach at sunset. I just wish that was every day! Oh how perfect are those skies! Spectacular! How will you tear yourself away?! Reena, what a beautiful sky and a lovely sight to see. 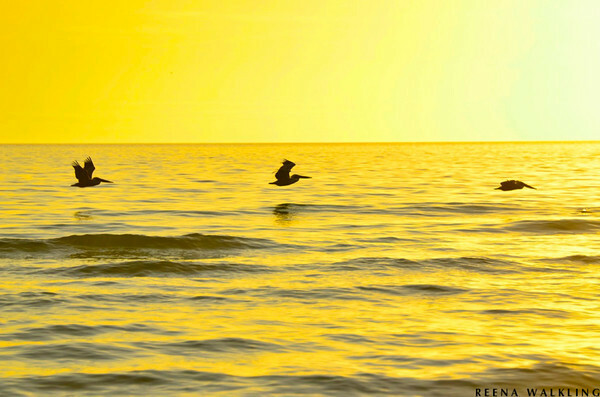 I loved all the photos, especially the last pelican shot. Lovely post and gorgeous photos. These are truly amazing, the colours are so wonderful, I'm soaking them up! Incredible colours. I'm amazed at how phenomenal the world around us is. Can I use them for my blog post on Feb. 28-29 ...the title is journey, my last day for the Haiku Challenge.